True checkered diamonds are scarce; moreover, other diamonds, confusingly, are sometimes incorrectly given this name. The motif, introduced in the motifs3.htm file in Part 1, is shown on the right in a drawing that originated in Westropp’s book on (mainly) nineteenth century Irish glass. Notice the depth of cutting of the “cross-cuts” — this distinguishes the motif from its much more usually seen close relative, the cross-cut diamond. Until recently the only actual example of the double-checkered diamond on American cut glass known to the writer is an all-over cutting on a pocket flask owned by Christian Dorflinger (Feller 1988, p. 204) and probably cut about 1880 when O’Connor was superintendent of Dorflinger’s cutting shop. The motif also appears, accompanied by fans, in two illustrations reproduced, apparently, from a newspaper account of O’Connor’s cutting shop in Hawley, PA (Barbe and Reed 2003, p. 190). 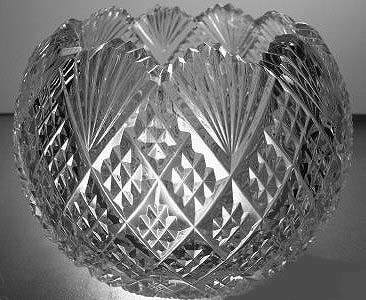 All of these examples have patterns that match that on the following small rose or violet bowl. O’Connor called this pattern Lace Diamond. If Dorflinger used a pattern-name, it has been lost. This example could have been cut by either company. D = 3.5″ (8.9 cm), H = 3″ (7.6 cm). Sold for $49 at an eBay auction in 2004 (Image: Internet). 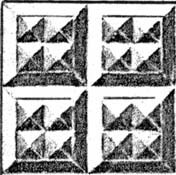 This image of the double-checkered diamond motif shows how easy it is to confuse the motif with the sharp diamond and strawberry diamond motifs. Feller incorrectly uses the latter pattern-name to describe the Dorflinger flask, as did the ACGA at its 1999 Convention where the flask was included in an exhibit of Dorflinger glass.